Selected by the American Library Association as one of its Great Websites for Kids! is free, such as playing with a friend. cream, gas for the car, or clothes. and those people are called entrepreneurs. wait for things we want. saving, one for spending, and one for sharing. or treat when she has saved enough. buying cookies or fresh fruit? Soda or milk? explain why you pick one item over another. choose which fruit to buy. aloud: Do I need this item? Can I borrow it? Would it cost less somewhere else? toy at various online or brick-and-mortar stores. your child how much you are saving. savings, if she helps clip or print out coupons. credit union with your child. accounts is protected by federal insurance. wants, and have him work toward that amount. bigger the balance is on each visit. credit cards or create fake documents. people to spend money without realizing it. never clicks on pop-up ads. $100 every year starting at age 14, he'd have about $23,000 at age 65. However, if he begins saving at age 35 he'd have about $7,000 at age 65. Assume the account earns 5% every year. Discuss how much your child can save. What will he have to give up? Is it worth it? and compare the interest rates. making purchases online, or as a convenience. as much as people who did not go to college. child's college tuition and expenses each year. default rates, average monthly loan payments, and employment prospects by using the "College Scorecard" at collegecost.ed.gov/scorecard. families don't pay the tuition sticker price. Paying for College tool to compare financial aid offers at consumerfinance.gov. budgeting worksheet available at mymoney.gov. in place could help him avoid using credit cards. you could be charged high interest. (the amount you take home). taken out of a paycheck. Discuss what taxes pay for, including schools, road maintenance, and medical	help for the elderly. Once your child has a steady job, help him set up an automatic savings program so that at least 10% of earnings goes directly into his savings account. a Roth IRA (Individual Retirement Account). earn to grow tax-free for life. it would take to double your money. nine years (72 divided by 8 is 9). and affect your chances of getting a job. There may be an emergency expense that you can't pay off immediately and need to charge. That's why it's important not to charge everyday items. would for any other product. you are entitled to, by law, until you turn 26.
available to you at healthcare.gov. lease, or rent a car. insured bank or credit union. worth of living expenses instead of only three. mix of stocks, bonds, and cash. $2,000 over the course of 35 years. Think about your goals. Attending college? term future, and make a plan to achieve them. For more information go to investor.gov. What is Money As You Grow ? How can you use Money As You Grow ? Who's Using Money As You Grow ? Money as You Grow was recommended as an initiative from the President's Advisory Council on Financial Capability, chaired by John W. Rogers and vice-chaired by Amy Rosen. 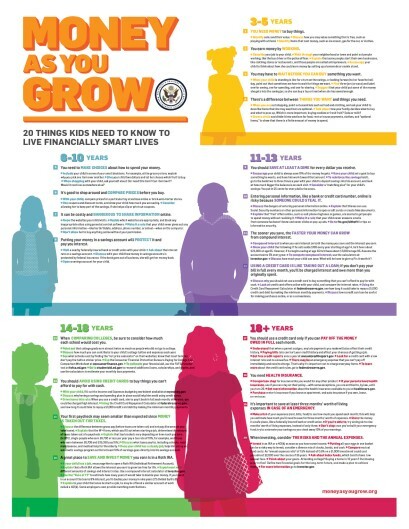 The initiative, spearheaded by Beth Kobliner, chair of the Council's Money as You Grow working group, offers 20 essential, age-appropriate financial lessons—with corresponding activities—that kids need to know as they grow. Written in down-to-earth language for children and their families, Money as You Grow will help equip kids with the knowledge they need to live fiscally fit lives. The lessons in Money as You Grow are based on more than a year of research, and drawn from dozens of standards, curricula, and academic studies. The President's Advisory Council on Financial Capability (PACFC) was created by Executive Order 13530, which was signed by President Barack Obama on January 29, 2010. Its charter is to advise the President on promoting and enhancing financial literacy and capability among the American people. While the President's Advisory Council on Financial Capability cannot by federal statute become operational, it is charged with providing financial capability policy recommendations for the nation to the President of the United States. One of the key objectives of the President's Advisory Council on Financial Capability is to find ways to improve the financial capability of young Americans. Families can use Money as You Grow to start a dialogue about money and teach kids important lessons about saving, making choices, and avoiding debt. 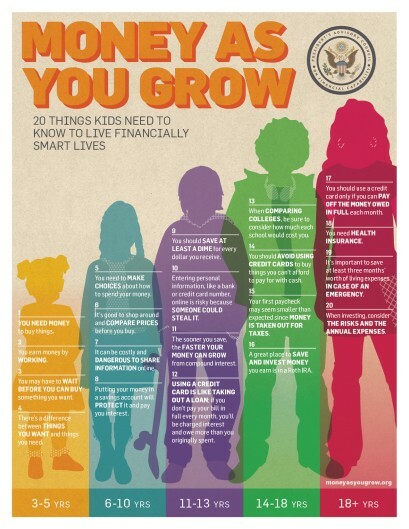 Put up a Money as You Grow poster on your refrigerator, try the activities in your everyday life, and check to see if your children know the milestones for their age groups. Community organizations like libraries, schools, and religious groups can provide Money as You Grow to families. Nonprofits geared toward kids, families, and financial literacy can share Money as You Grow with their members. Businesses that reach young people and families can share Money as You Grow with employees, customers, and clients. Ashraf, Nava, Dean S. Karlan, and Wesley Yin (2004). SEED: A Commitment Savings Product in the Philippines. Policy paper. Chatterjee, Swarn, et al. (2010). Individual Wealth Accumulation: Why Does Dining Together as a Family Matter? Munich Personal RePEc Archive (MPRA). Dhar, Ravi, Joel Huber, and Uzma Khan (2005). The Shopping Momentum Effect. Journal of Marketing Research. Dupas, Pascaline, and Jonathan Robinson (2011). Why Don't the Poor Save More? Evidence from Health Savings Experiments. The National Bureau of Economic Research. Education Pays (2011). Bureau of Labor Statistics. Hagedorn, Eric, Mark C. Schug, and Mary Suiter (2012). Starting Early: A Collaborative Approach to Financial Literacy in the Chicago Public Schools. Journal of Economics and Finance Education. Fluent Public Opinion + Market Research (2011). Impact Assessment Report: For Me, For You, For Later. Prepared for Sesame Workshop. Hershfield, Hal E., et al. (2011). Increasing Saving Behavior through Age-Progressed Renderings of the Future Self. Journal of Marketing Research. Hira, Tahira K. (2010). Childhood Consumer Experience and the Financial Literacy of College Students in Malaysia. Family & Consumer Sciences Research Journal. Hogarth, Jeanne M. (2003). Household Financial Management: The Connection between Knowledge and Behavior. Federal Reserve Bulletin July 2003. Holden, Karen (2009). Financial Literacy Programs Targeted on Pre-School Children: Development and Evaluation. La Follette School Working Paper No. 2009-009. Lusardi, Annamaria (2007). The Importance of Financial Literacy: Evidence and Implications for Financial Education Programs. Policy brief. Mandell, Lewis (2009). Two Cheers for School-Based Financial Education. The Aspen Institute Initiative on Financial Security. Issue brief. Moffitt, Terrie E., et al. (2011). A Gradient of Childhood Self-Control Predicts Health, Wealth, and Public Safety. Proceedings of the National Academy of Sciences of the United States of America. Madrian, Brigitte C., and Dennis F. Shea (2001). The Power of Suggestion: Inertia in 401(k) Participation and Savings Behavior. The Quarterly Journal of Economics. Norton, Michael, and Leonard Lee (2007). The "Fees → Savings" Link, or Purchasing Fifty Pounds of Pasta. Harvard Business School Marketing Research Paper No. 08-029. Pleskac, Timothy J., et al. (2010). A Detection Model of College Withdrawal. Organizational Behavior and Human Decision Process. Prelec, Drazen, and Duncan Simester (2000). Always Leave Home Without It: A Further Investigation of the Credit-Card Effect on Willingness to Pay. Marketing Letters. Sherraden, M.S. (2007). From Financial Literacy to Financial Capability Among Youth. Journal of Sociology and Social Welfare. Shim, Soyeon, et al. (2009). Financial Socialization of First-year College Students: The Roles of Parents, Work, and Education. Journal of Youth and Adolescence. Shim, Soyeon, and Joyce Serido (2011). Young Adults' Financial Capability: APLUS Arizona Pathways to Life Success for University Students Wave 2. Take Charge America Institute for Consumer Financial Education and Research. Staten, Michael (2007). Academic Success and Well-Being of College Students: Financial Behaviors Matter. Take Charge America Institute for Consumer Financial Education and Research. Tisdell, Elizabeth J., Edward W. Taylor, and Karin Sprow (2010). Financial Literacy Education for Adult Learners in Community-Based Programs: Report on the Mixed Method Study of Financial Educators. The National Endowment for Financial Education. Ulkumen, Gulden, and Amar Cheema (2011). Framing Goals to Influence Personal Savings: The Role of Specificity and Construal Level. Journal of Marketing Research. Janie Barrera, Founder and CEO, ACCION Texas Inc.